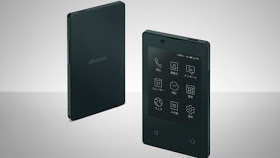 A 5.3 mm (0.2 inch) thick 4G phone was announced by Japan's largest telecommunications company NTT Docomo. The compact device, released in Japan next month, is designed to fit into a card holder. The smartphone weighs 47g and has an electronic paper touch screen, much like e-books. It will have limited functionality, with calls, text and a network connection, but no camera or device to work with mobile apps. The phone labeled Card Keitai KY-01L is manufactured by the electronics company Kyocera. NTT Docomo describes the phone as the "thinnest" in the world, but this claim is likely to be contested by other phone manufacturers.